Today logistics and transportation industry is making headway along with a wide variety of respective services, from sales and research to distribution and disposal logistics, delivering, moving, packaging and more. 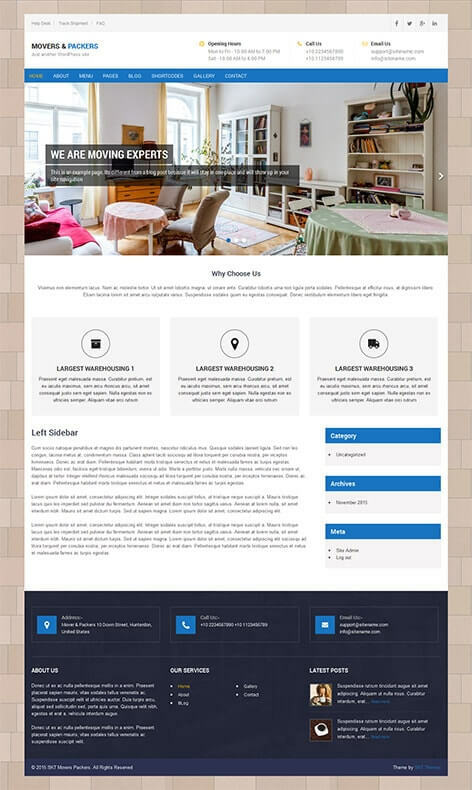 Hence they need an online website and what better than this free logistics WordPress theme. The extensive client market, on the other hand, as well as the gradual changes in its demands and requirements from the service providers call for new challenges and practices to simplify the interaction between them, make the whole relevant information accessible around the clock in 24/7 format and much more. Hence, having a strong and customer – directed, interactive and highly productive online profile in the form of a modern transportation or moving company website seems to be one of the most reasonable and operative techniques to adopt and achieve groundbreaking recognition in the digital arena. Customers are long used to check all the available information in search engines, read all the feedbacks and reviews to make a final decision, so your digital marketing based on your website can be the best stimulus for you to go ahead of your competitors and be in the center of the client attention. Movers and Packers is a free logistics WordPress theme in the current marketplace of affordable templates ready – made to unmistakably follow all your instructions and exceed all your expectations. Thus, if you are eager to establish strong communication ties with every potential partner and client, understand their demands from you and act accordingly without complicating steps, this WordPress – powered template is uttermost for you. A critical scrutiny has been thoroughly practiced while processing and coding this wonderfully convenient and environmental – friendly template to be precise and accomplished in each and every given aspect so that anyone far away from programming and web design can be authorized to deal with the theme freely. This strategic mechanism will let any single business or corporate manifestation be fully revealed and proudly showcased within the frame of this template, be it logistics, construction, agriculture, towing, car dealing, postal services and much more. There is less stress about spending financial means and having access to Movers and Packers since this free logistics WordPress theme is totally free for anyone across the globe with aspiring plans and boldness to conquer new business heights. As such, it seamlessly lowers the obstacle of entering into website running with which many startups or small companies functioning on a limited budget may face. In an endeavor to assist you in sifting through the good and bad you might encounter on your way, we strongly recommend you to review Movers and Packers and consider it for your future plans to result in a broader audience and tangible deliverables, more orders and persistent positive feedback. If we honestly try to get into the meat of the essential reasons why we hold this template in esteem as a masterpiece, the first one will be totally user and customer – friendly layout of it so that anyone can install the theme and make further interventions without any confusion. From intuitive processes to customization walkthroughs, this free logistics WordPress theme generates it all for your convenience and relevance. Powered with a plenty of flexibility, you can arrange everything as per your needs and market expectations to result in driving more prospects to your website. With this template you never need to fork up your hard – earned money to completely dominate over your digital profile and institute a dynamic corner with attractive visualization and inviting frame. Moreover, accurately arranged structure and intuitive operation are available for you to get for nothing at all. Based on much demanded and modern Customizer, amazingly elastic and well – thought out, GLP licensed for free business and personal usage and totally free, fast – loading and smoothly navigable, Movers and Packers of SKT production is the one to make an overnight WordPress expert out of you to play around the given theme from the backend. It is powered to celebrate business – looking appearance and reliable inner performance, as well as easy to use and follow character, rather than making you trawling here and there in order to understand all the ins and outs of the theme. 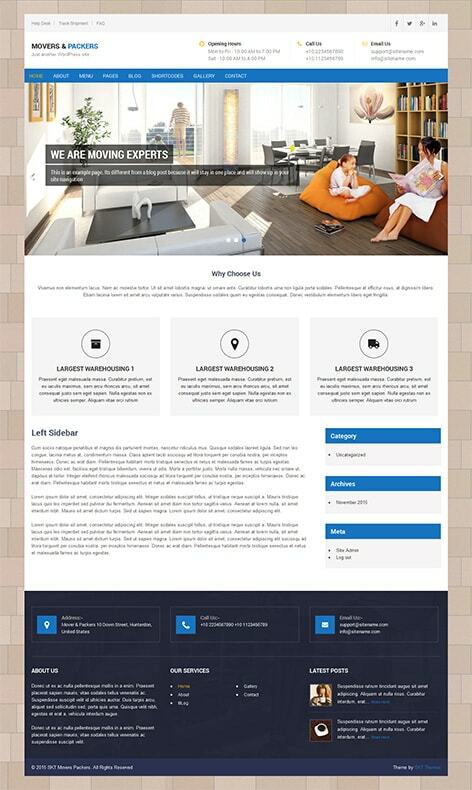 And as such, this creative and appealing, lightweight and taut free logistics WordPress theme comes with convenient theme sections, such as home, about us and services to showcase your business profile, experts and stuff, provide the website viewer with a comprehensive list of the available services, contact us area to publish your contact details, location and more for your clients to visit you physically and much more. You can also add your contact numbers on the top to be easily trackable, arm the homepage slider with 3 different slides and let them purvey your professionalism with high – quality images, change the image and color of the background and yet much more to be delivered with the theme. Perfect dropdown level navigation, single page layout for more organized view, blog availability to keep your presence vigorous and interesting, standard pages like search and achieve etc are can also be the indispensable parts of your top – rated website. In case you have far – going place in the commercial field without any additional invest, this is another situation when this free logistics WordPress theme comes into play. Simply add WooCommerce plugin and let your website get involved into e – commerce relations with thousands of purchasers across the world to pay for your services and products. Other practical plugins including Contact Form 7 and Nextgen Gallery are also supported by the theme. With colossal traffic coming from mobile and tablet users, responsiveness of the theme directly becomes one of the much – demanded qualities every contemporary template should have in its arsenal. And this is the point Movers and Packers Pro feels like a fish in water. No additional efforts and time to build another mobile version or hire expensive developers to make your content mobile – optimized. This template is mobile and device – friendly enough to effortlessly respond to any screen dimensions and behave accordingly for the exceptional mobile look and feel.